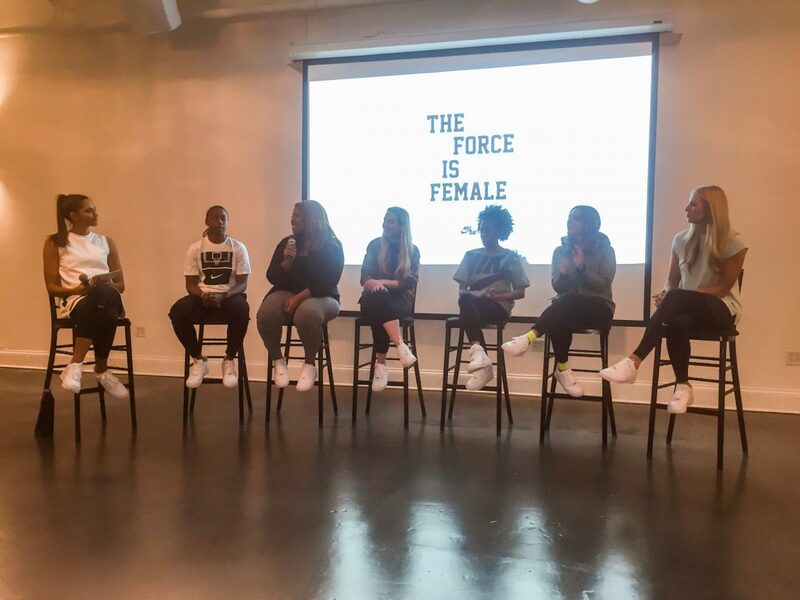 In honor of International Women’s Day today, Nike Chicago hosted a debut event Tuesday night downtown, honoring women from all walks of life, in hopes of inspiring other women to go for their goals. The theme was “The Force is Female,” which coincides with Nike’s recent campaign to highlight strong women. Nearly 50 females from the Chicagoland area gathered to hear six panelists talk about their journeys and how being a woman has affected it. Hosted by sports broadcaster and fitness model Lauren Young, the panel included Seattle Storm point guard Jewell Loyd; Ghana plus-size model and fashion blogger from Hayet Rita; Chicago Cubs sports nutritionist and blogger from the Huffington Post Dawn Jackson Blatner; Visceral Dance Chicago professional Paige Fraser; founder of Chicago running group Three Run Two Mica Bernal; and Chicago life coach and therapist Tiffany Louise. Blatner, who has worked in a male-dominant field for eight years now, admits she still is finding ways to use her voice and feel important in her career. However, she has learned to use her minority presence as motivation to make it a strong presence. “I am always the only women, and there is not even a female bathroom in the [Cubs] clubhouse, so I have to make sure I go to the bathroom beforehand,” Blatner said. When she realized the Cubs were probably going to the World Series in 2016, she wanted to help them get there. However, her male boss told her she wasn’t allowed in the Los Angeles Dodgers’ clubhouse. Not letting that stop her, Blatner snuck in anyways, and started making smoothies and different foods for the players, that actually helped them play better! She kept doing this the rest of the season, and when the Cubs won Game Seven in November, Blatner was the first person to receive a champagne shower. On the opposite end, Bernal is surrounded by women who she looks to for inspiration on a daily basis. 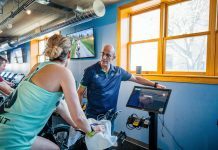 Bernal and her husband, Nico, started Three Run Two four years ago with a mission of being a totally inclusive running group; immediately, the couple recognized the passion and drive the women of the group exuded, and knew that what they had going was a good thing. After the panel, Louise led a goal setting workshop to help the attendees find ways to achieve their goals. As a life coach, she says she meets new women every day, and has learned to value those relationships to help with her own success. Louise went on to advise women to step out of their comfort zone and go for their goals, or else they will not be achieved. While she thinks being lazy ultimately stems from fear, she finds one’s fear is the most common reason for not achieving a goal. Nike+ Running Club Coach Robyn Lalonde then led everyone on a three mile run around the city, motivating “the tribe” to stick together and push through something as a group. “It wouldn’t be a Nike event without getting a little sweaty,” she said. Refreshments were served after the run, and participants were encouraged to stick around after to stretch, eat and mingle with other women. 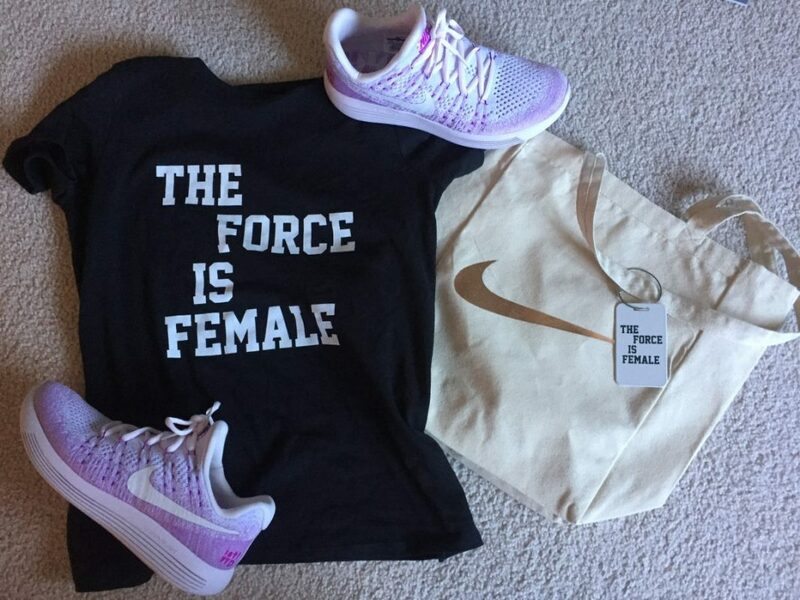 Each attendee received a goodie bag with Nike LunarEpic Flynit 2 shoes in either pink or purple, (the International Women’s Day colors) a t shirt reading “The Force is Female,” a journal and some beauty products. On the way out, everyone was handed two flower bouquets – one for themselves, and one to give to a woman who inspires them. Hello! This is a great article! I wish I would have known about this event! I would have loved to go! How did you find out about this event? Is there a facebook or instagram page to find more events like this? Thank you! Check out Nike Running Club Chicago! It should have events on there.